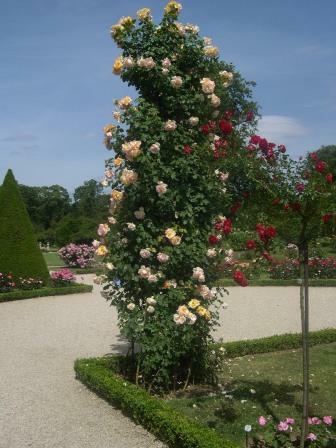 Parure d’Or a Delbard rose trained on a pillar. We love climbing roses. But, like many gardeners we’ve run out of fences, walls and arbors to put them on. There is an easy solution to putting a climbing rose anywhere you want and it’s called pillaring. Basically, you install a structure and then wrap the rose canes around it until the reach the top. The structure can be anything you want from a simple pressure treated piece of 4″x4″ by 10′ (or higher) lumber to something made out of metal to even an actual old pillar! While it looks daunting it’s not. And yes, it does take some attention periodically during the year to keep the rose tidy and trained but the result is well worth it. Make sure what ever structure you use is well anchored in the ground. The rose can be heavy and once fully grown and leafed out the wind can really knock it about. Wine the main canes “barber pole” style up the structure. Try to keep them at 45 degree angles as you go up to encourage blooming all up and down the pillar. The laterals that shoot off the main cane can be trimmed regularly to keep it tidy. Every few years you may need to take the rose off the pillar, remove an old cane and tie in the new ones. Use your instincts as to when you should do this. We’ve prepared a short video for you showing how it’s done. Enjoy!